Their motif looks like an astonomers' diagram of an eclipse! What the hell does that mean!? The eclipsing of financial freedom behind the moon's shadow of electronic slavery? Someone on the David Icke forum has made an interesting observation: The phrase "Coins are dropped" is subtly different from the more colloquial phrase "Coins GET dropped". It's a small change in verb usuage, but it alters the meaning of the phrase. 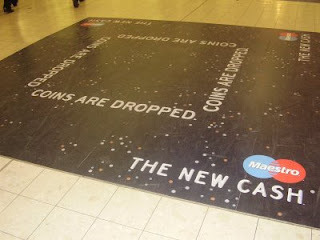 "Coins are dropped" can be transcribed as "Cash gets phased out and replaced with only electronic money." I got the meaning that coins are dropped reminds one of the 'penny drops'. Intersesting point of view (as always). However, there are those that say the a money society (which Carlyle called the "Cash Nexus") de-humanises and even brutalizes all economic exchanges between people. Accordingly, extinguishing the need for cash can be a prelude to genuine communitarian government. A truck-token society is not the only outcome of a cashless society. Ben, spot on! Cashless society, with all this 'supposed' identity theft [right, powers that be providing problem, reaction, solution on that one!] going on they want us to trust their systems? GEEZ Louise! They want us all reduced to digits. It's pretty sad, funny thing is, here in the U.S. I get very angry when I pull up to a gas/petrol station where it says "PRE-Pay or use Card". I never use my debit card at all, I always go withdraw all my cash on "pittence day". 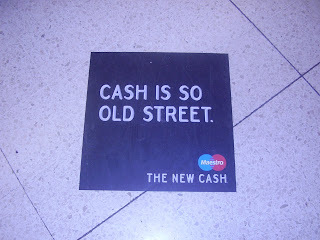 Your right, its a push to get use to go cashless and reduce it all down to digits. Yes that's true. Simply having access to cash alone is not a solution to financial imprisonment. The use of a paper Fiat currency is far from perfect, I don't deny! A barter or gift economy comes to mind as an ideal way to live. There's a good book by EF Schumacher called "Small is Beuatiful" which presents some revolutioinary and, in my view, very progressive economic ideas. It shows how small local businesses could become the mainstay of human economies rather than mega-corporations or local and national government bureaucracies. However one could argue that the book is not really revolutionary because that kind of "decentralized mini-capitalism" is the very economic system that human beings naturally evolved into under in prehistoric times. However even in those times, at least since farming was invented in the Neolithic Age, people also used tokens of exchange to overcome the limitations of barter. EG: If I were a pig farmer and you ran a barley field I could swap one of my pigs for a hundredweight of your barley, but you wouldn't be able to pay me until the harvest. Therefore you could give me a token to close the deal and remind me to collect. There's nothing dehumanizing about that, in fact it's very expedient. Money only becomes dehumanizing when it's used as a weapon of power. Thanks for your comment; I'm going to SitP next week; see you there. I know what you mean about making us digits. Have you noticed the way economists and politicians speak: they no longer even call us "people" or "Human beings", they use the loaded, Orwellian term "Consumers". This makes my skin crawl whenever I hear it! I am NOT a consumer! Silvio Gessel had some intersting economic ideas. Yup, I noticed too, they're catch phrases really annoy me fully. They speak in "Corporatease". What bothers me even more is that Corporations have just as many 'right' as a human being thanks to crafty lawyers and judges treating them as if they were a living sentient entity! You would have laughed if you had seen me watching the documentary "The Corporation". I continuously had to stop it as I was raving mad walking around, gritting my teeth. It was a tough one to watch! Thanks, Aferrismoon, that's a name to look up. Michael, that sounds an interesting programme judging by your reaction. That lady doctor I met (the one in my article "Hard Work") has sent me two more books. One called "Unjust Rewards", Polly Toynbee's follow-up and another called "Corporate State" by George Monbiot. I'll let you know what they're like when I've read them. I notice LETS schemes have even made the plot of "The Archers"!